Last night we went out with a big group to watch one of our friends play bluegrass music at a neighborhood restaurant. The rain drizzled lightly but no one seemed to care as it was a fun night, the music was good, the kids were dancing and it was a nice way to wind down the weekend. Then, without warning but coming on the heels of a pretty emotional weekend, our usually mellow, sweet child went from zero to sixty and a tantrum of epic proportions ensued. It was the kind of tantrum I've witnessed other people's kids have on occasion but fortunately, not that common for us. And just when I thought we'd escaped the toddler years mostly unscathed only to find out the pre-school years are much worse, there we were running for the car, kicking and screaming child in our arms, embarrassed beyond belief and glad that one of us at least had the presence of mind to pay the bill a few minutes earlier. I want to say that I handled this and the other challenges of the weekend (another full-blown fit upon leaving a party the night before, as well as a whole new level of verbal abuse that I thought I'd have to wait until the teenage years to experience) with grace and calm. I've read the parenting books, I know that children need love, especially when they least deserve it. But man, is it easier said than done. All I can say is this parenthood thing is a learning process and sometimes it hurts. It is also full of unexpected moments of beauty and a love that fills you up completely and makes you wonder how you survived before you knew this kind of love. As year four of our girl's life moves quickly toward a close, it feels like we have all come a long way. 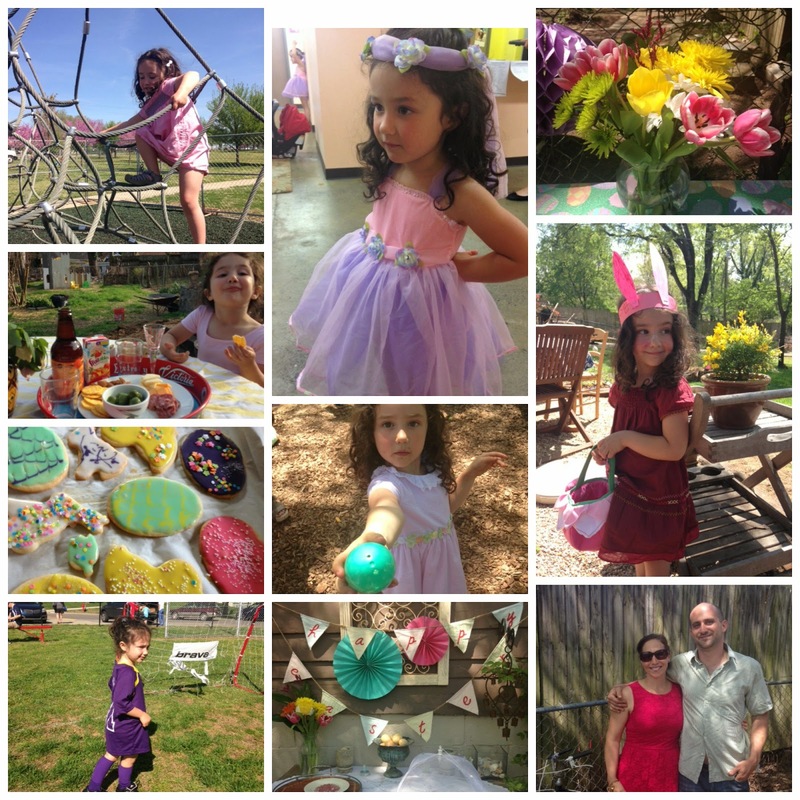 The last year has had its ups and downs and April felt like a microcosmic version of the whole year. It was, like the rest of the past 10 months or so, a roller coaster of emotions. I have always loved April because I look forward to Spring and to celebrating Easter and it was also my mom's birthday month. So the happiness and sadness are intertwined, as is usually the case. Adding to that, yesterday was the official due date of the baby we lost. It's hard to believe that if things had worked out differently we would be welcoming another child into our lives right about now. I've moved into the latter stages of grief, however, and instead of a stabbing pain when I think of that, it now feels more like a subtle twinge. And, instead of feeling overwhelming sadness when I hear of other people's babies being born, I now feel genuinely happy for them, the darker feelings gradually being replaced by the joy and happiness that I used to always feel at the sight of a new baby. My own 'baby' is quickly becoming a little girl, coming into her own on so many levels and starting to show her predilections and preferences more and more as well as her "spirited" personality. She's a tough cookie and I wouldn't have it any other way. Not too long ago she started climbing all over the place on the playground without much fear, something I thought she may never show any interest in doing. She's gotten really good at riding her bike, another thing she was slow to show interest in. She played her first soccer game and was actually not bad at it, and she is still really interested in music and dance. And lastly, Daniel and I celebrated our third wedding anniversary (and 9 years together) and it feels like our bond just keeps getting stronger. I know how cliché that must sound and I'll try not to fall too deep into sentimental dribble. But I just feel so lucky to have met this guy and to be able to have a family with him and grow together as parents and as partners. He may not share in my love of coffee or foreign films or a good thrift store find, but he does the bath and bedtime routine with our daughter and then cleans up the dinner dishes –after a full day of work—because he can tell I’ve had a hard day. And he can stop me in my tracks when I’m about to go off the rails about something inconsequential. He is so patient with me even when—mostly when—I do not deserve it. Let's hope it is true that April showers do bring May flowers because it's raining like crazy out there today. I also hope that after the storm that was April, May will be a little bit calmer. But I'm not holding my breath.